For Wrecker Contract Information Click on Vehicle Impounds above. Welcome to the official website of the Meridian Police Department. We hope that you find this website helpful. As you look around if you have a question and you don’t find the answer here, please feel free to call or email us and we will help you. 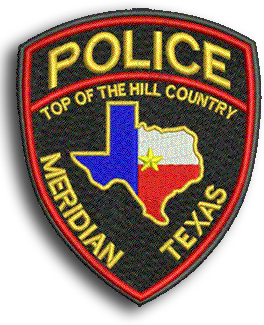 The Meridian Police department is a small law enforcement agency comprised of three sworn officers: a Chief of Police and two patrol officers. We serve an incorporated General Law City with a population of approx. 1,600. Meridian is the County Seat of Bosque County. The City of Meridian is located at the intersections of State Highway 6, 22, 144, and FM 1991 and 2840. Dallas/Fort Worth is approximately 90 miles Northeast, Waco is 45 miles Southeast, and Austin is 120 miles South. The Meridian Police Department’s mission is to provide a safe environment for the citizens and visitors of Meridian. Our goal is to reduce the number of incidents of crimes against persons, property and control of the drug trade. We have pride in our community and because we are such a small community we personally know our citizens and welcome our visitors. It is only through community involvement that our policing efforts can be effective.